Better, more consistent surf than the Gulf coast beaches. Great for surfing and bodyboarding. Driving and parking is allowed on many Atlantic beaches during low tide. Atlantic side often has sea beans on the beach (important if you like to collect them). Traffic is generally less congested than on the Gulf coast beaches of Pinellas County (except during special beach events / holiday celebrations). Water temperatures are usually 5 to 10 degrees warmer than the Gulf of Mexico during the winter months, and 5 to 10 degrees cooler during the summer Atlantic beaches and coastal towns tend to feel cooler than Gulf beaches during the hottest months of the summer because of the nearly constant ocean breezes off the relatively cooler waters of the Atlantic Ocean. Driving south on the beach at Ponce Lighthouse Park. Surf can be high and rough much of the time on Central Florida’s Atlantic coast. This means dangerous rip currents can and do occur. Jellyfish can sometimes be a problem, especially during winter and spring months. Volusia County (Daytona and New Smyrna) has the highest number of shark bites of anywhere in the state, though almost all are very minor and the total number is insignificant when compared to the number of people entering the water. Cars are allowed to drive on some Volusia County beaches. Exercise due care, especially with children. Don’t lie on the sand or sit in a beach chair in the driving lanes. The surf on the Atlantic Ocean attracts a lot of young folks who like to play in the waves. The Atlantic beaches of Volusia County and Brevard County do tend to have a larger percentage of young people (under 40 years of age) than the Gulf coast beaches do. The Gulf coast is geared more toward the retirement community. The Atlantic coast’s proximity to Orlando and to Kennedy Space Center as well as the more surfing and beach oriented culture of Volusia and Brevard Counties tends to attract and retain younger folks. However, in the larger metropolitan areas on the Gulf coast there are plenty of younger people among the retirees. This is particularly true of Clearwater Beach. Want to download this information about the closest beaches to Orlando to your computer? You can download these web pages as an e-book (pdf file) and take it with you on your laptop or ipad. You can even print a copy for yourself! 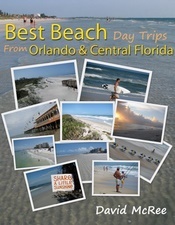 Over 100 pages of info to help you find and enjoy the closest beaches to Orlando & Central Florida. Note: I use PayPal to handle the transaction. You can pay with your PayPal account if you have one, or you can pay with a debit or credit card. You do not need to have a PayPal account to buy the book. Since all the processing is done on a secure PayPal web site, I never have access to your debit or credit card number or even your address.